The findings support theoretical and computer-simulation models that have predicted abundant water on Jupiter. NASA scientists peering deep inside Jupiter's Great Red Spot — a storm that has been raging on the planet for over 350 years — have detected signs of water above the planet's deepest clouds. The pressure of the water combined with their measurements of another oxygen-bearing gas, carbon monoxide, imply that Jupiter has two to nine times more oxygen than the Sun, researchers said. 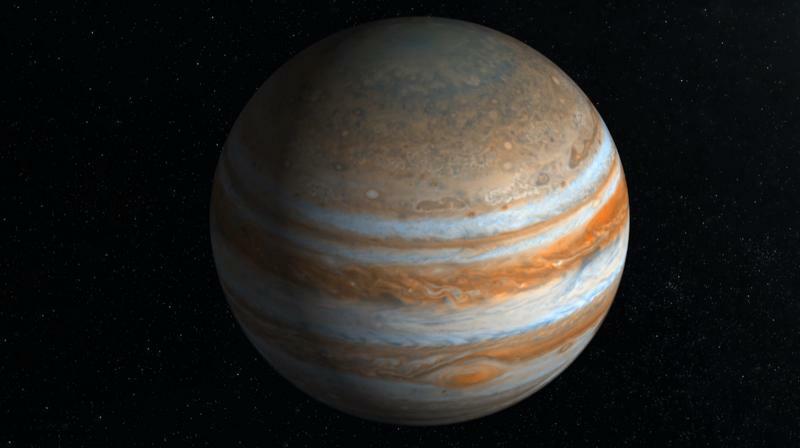 The findings, published in the Astronomical Journal, support theoretical and computer-simulation models that have predicted abundant water on Jupiter. The revelation was stirring given that the team's experiment could have easily failed. The Great Red Spot is full of dense clouds, which makes it hard for electromagnetic energy to escape and teach astronomers anything about the chemistry within. "It turns out they're not so thick that they block our ability to see deeply," said Gordon L Bjoraker, an astrophysicist at NASA's Goddard Space Flight Center. The data collected will supplement the information NASA's Juno spacecraft is gathering as it circles the planet from north to south once every 53 days. Among other things, Juno is looking for water with its own infrared spectrometer and with a microwave radiometer that can probe deeper than anyone has seen -- to 100 bars, or 100 times the atmospheric pressure at Earth's surface. If Juno returns similar water findings, it could open a new window into solving the water problem, said Goddard's Amy Simon, a planetary atmospheres expert. "If it works, then maybe we can apply it elsewhere, like Saturn, Uranus or Neptune, where we don't have a Juno," she said. Juno is the latest spacecraft tasked with finding water, likely in gas form, on this giant gaseous planet. Jupiter is thought to be the first planet to have formed by syphoning the elements left over from the formation of the Sun as our star coalesced from an amorphous nebula into the fiery ball of gases we see today. A widely accepted theory until several decades ago was that Jupiter was identical in composition to the Sun; a ball of hydrogen with a hint of helium -- all gas, no core. But evidence is mounting that Jupiter has a core, possibly 10 times Earth's mass. Spacecraft that previously visited the planet found chemical evidence that it formed a core of rock and water ice before it mixed with gases from the solar nebula to make its atmosphere. The way Jupiter's gravity tugs on Juno also supports this theory. There's even lightning and thunder on the planet, phenomena fuelled by moisture. "Jupiter's water abundance will tell us a lot about how the giant planet formed, but only if we can figure out how much water there is in the entire planet," said Steven M Levin, a Juno project scientist at NASA's Jet Propulsion Laboratory.